Lee Daniels is well aware that when his newest Fox series, Star, premieres Wednesday, Dec. 14, many comparisons will be made to his hit show, Empire. But that is expected. When news hit about the series, which stars three young newcomers, it was billed as an Empire spinoff, but that's definitely not the case. Star tells the story of three female singers trying to make it in the music business, and yes, it's a tribute to some of Daniels' favorite films. The series tells the story of Star (Jude Demorest), who is determined to make her voice heard. Star teams up with her sister Simone (Brittany O’Grady) and Alexandra (Ryan Destiny), a girl she met on Instagram, to start the ultimate girl group. "The show is called Star, but it's not all about Star. It's my tribute to Dreamgirls, Valley of the Dolls and Paris Is Burning. The 'in' for the first episode is Star. Just like the 'in' for Empire was Cookie," Daniels tells The Root on the Atlanta set. But, of course, starting this girl group isn't as easy as Star thinks. The obstacles she's met with include an abusive relationship in her home environment and trying to get her sister and friend to actually like each other. As with Empire, Daniels and his own road to fame and Hollywood play out on the screen. "We always talk about my life through Empire, and that's sort of like my family. But this is about what happened when I left home and went into Hollywood and what it's like growing up in Hollywood pre-Spike Lee era, and what I would do and had to do to find success in this business. These girls are indicative of that. It's about finding my way, and ultimately finding family and success happened," Daniels says. When it came to casting for the series, Daniels wanted new faces, and he enlisted the help of his sister, casting director Leah Daniels, to find the girls. "I enjoy finding stars. Puffy's [Sean Combs] first movie was Monster's Ball. I love new actors and mixing them in with the pros. My sister is my casting director, and over the years, I've learned to give Leah the script as I'm writing it. And she's off finding people simultaneously," Daniels says. And when it comes to the pros, Daniels definitely has one of the right ones. Hailing from New Jersey, Queen Latifah's career has gone from rapping about U.N.I.T.Y to becoming an award-winning actress. In last year's HBO film Bessie, Queen Latifah blew the audience away with her portrayal of the legendary blues singer Bessie Smith, and Latifah won the Screen Actors Guild Award for Outstanding Performance by a Female Actor in a Miniseries or Television Movie. 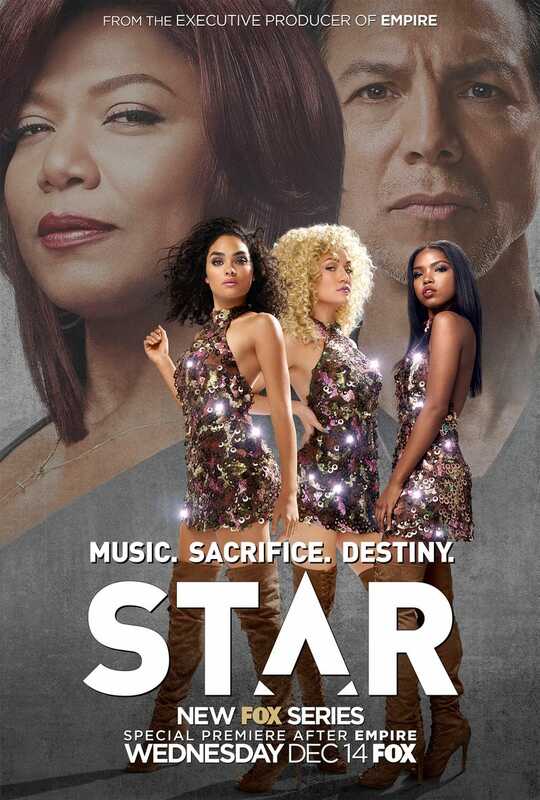 In Star, Latifah plays Star and Simone’s long-lost godmother Carlotta and struggles with reconnecting with the girls, as well as drama from her own family. And, of course, Latifah gets to show her singing range once again. Both Daniels and Latifah say that doing something together was a long time in the making. "Lee and I have been talking about different ideas for about three or four years. And finally he had this idea. He sent me a 13-page treatment of what he saw this show as," Latifah says. "It was completely different from what was out there. And seeing his vision on it sounded like a cool project to do." As a mother figure to the girls, Latifah's character is thrown into the fray of not only them wanting to become singers but also coming to terms with her own past and how she had to struggle in the music business. "All she wanted to do was be a mother to these two girls, but she had her own life troubles and was even out of touch with her own child for a while. And now she's trying to make up for lost time," Latifah says about her character. "And now that she has what she wants, she's questioning herself about being up for the job, because they're not little girls; they're teenagers." In Latifah's own real life, she's evolved from music to acting and sees a correlation from the show to real life. "It's you having to hustle to be seen. To be somewhere people can put your eyes on you and notice you. Now you can become successful with a record company and without just through social media," Latifah says. In Star, there are lessons to be learned, whether about life in general or trying to make it in the "business." Daniels says he hopes that people will take away something from it. "We explore the Amy Winehouse-Whitney Houston scenarios and what happened in that world. These are people who I knew and I draw from personal experience. Hopefully young entertainers relate and learn what not to do. Or what to do," Daniels comments. Star premieres on Fox on Wednesday, Dec. 14, 9 p.m. Eastern/8 p.m. Central.